What happened to the Plantronics Polaris headsets? Are they discontinued? 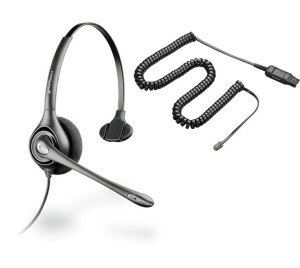 Yes, the Plantronics line of P-series (Polaris) headsets were discontinued around Q4 2008 in an effort to streamline the product assortment. Have no fear. You can get essentially the same headset now but you just need to make sure you are getting the right connector cable. The H-series headsets look identical to the old P-series but they do not have the same internal amplification properties. You will need to buy the Plantronics A10 cable which looks just like the spiral black cable you used to get with the Polaris headsets but it is actually different electronically. It will bring the amplification of the H-series headset up to the same level as the old P-series. As long as you keep your H-series headset paired with an A10 cable you’ll have no problems. The only issue is if you have old P-series (Polaris) headsets also floating around your office and employees start mixing and matching over time, you will start to get complaints about weak volume. Just make some sort of marking with colored tape or something similar so you can keep the right headset with the right cord. If you buy the H-series headset by itself it will not come with the A10 cable so you’ll have to be sure and order that, too. Some websites like Founders Telecom have made it easier by pairing them together for you (just like the old Polaris that came with the cable). In this case the headset and cable are already together so no need to search for the cable separately.